Episode 25: Jim Stoppani on Daily Full-Body Training, Fasting, And More. Dr. Jim Stoppani brings plenty of energy—and plenty of gummy bears—to the recording studio. 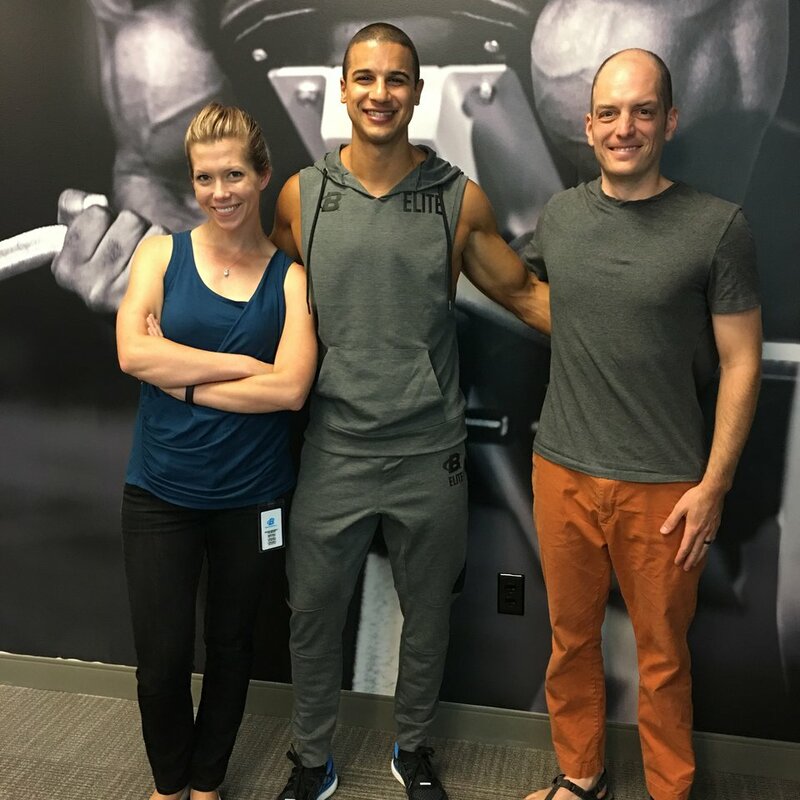 He's been espousing the virtues of full-body, near-daily workouts in recent months, and says it could just be the best training technique out there—if you do it right. He also goes deep into the science and practice of intermittent fasting, which allows him to stay lean and energetic well into his fifties! How he's able to stay lean without "cardio"
Nick Collias:	Nick here. Just wanted to tell you about a sweet new workout on Bodybuilding.com. Now, you may have done timed sets in the past like squats for 30 seconds straight instead of five or 12 reps per set. And if you have, you know that it's uniquely intense but it's also just a really different training experience. Plenty of people find that they can do more reps, more total work, when they're not being told when to stop. So, how about this? You just set the timer for four minutes and see what you can do. That's the idea behind Jim Stoppani's Four Minute Muscle Protocol. Just go to: Bodybuilding.com/FourMinuteMuscle to learn more and see the full body workout. Welcome to The Bodybuilding.com Podcast, everyone. This week we're nearly hair-free. Nick:	I'm Nick Collias. I'm an editor for Bodybuilding.com, as is our co-host, Heather Eastman. Nick:	Over there across the table we have none other than Dr. Jim Stoppani. He's the owner of JYM Supplement Science, a researcher, author, the man behind Shortcut to Size, Shortcut to Shred, Shortcut to Strength. You've been an author a whole bunch of different places, written many, many articles for Bodybuilding.com, as well. Great to have you here. Nick:	More recently, Jim has been doing something pretty unique for the site, even though these aren't necessarily the same sort of workouts that people who follow our site are always accustomed to doing. They're full body workouts. Something I hear you talking about a lot these days and I want to chat with you about that and kind of put it in context of where this fits in the progression of you as a lifter and a researcher. Jim:	Yeah, it's an interesting progression. I've been training since I was seven years old maybe even younger. I've literally been training all my life. My father built quite an impressive home gym. Jim:	Yeah, I wanted to hang out with my dad. He had the Muscle & Fitness magazines, back then it was Muscle Builder, not even Muscle & Fitness. I would read the magazines and learn about what exercises hit different muscle groups. Then I started learning about muscle fibers and I thought, "Wow, there's a whole science about how to make muscles bigger and stronger." Nick:	What were the first sorts of plans that you followed when you said, "All right that's it, I'm going to go and I'm going to lift some weights?" Jim:	I followed like the Joe Weider, the Arnold Schwarzenegger workouts. I would follow the diets and muscle ... I would cook, make my own meals instead of my mom's meals because I wanted to get a certain amount of protein and a certain type of carbs. I've been doing that for quite a while and the nice thing is, it's not only have I been doing it in the gym, but I've also been studying it in the lab, consecutively, at the same time. 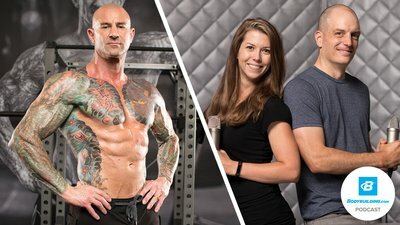 What it's allowed me to do is, prior to being known as the guy behind the Shortcut series, and "Encyclopedia of Muscle and Strength" book and the science editor, I was researching what was happening in the lab and trying to connect what's going on at the level of the gene and how to apply that to results in the gym. I studied with people like Dr. Bill Kraemer who's well known for hormone production, testosterone, growth hormone following exercise. We used to study what we call endocrine function, meaning hormone is released like testosterone from the testicles or growth hormone from the pituitary gland, travels to the muscle, and the anabolic hormone instigates muscle growth. We soon realized that we don’t have to rely on things from the blood, the muscle itself is making changes that are changing muscle size, muscle strength, so there's local factors going on. That's when I started realizing that it's not about these systemic changes, but there's more local things going on in the muscle fiber. I got interested in gene regulation and so ended up doing a post doc after University of Connecticut School of Medicine where I was studying gene regulation and metabolism and exercise, what happens when you fast to metabolic genes. Speaking of fasting, I was actually studying fasting in 2000 and I know that we'll be talking more about that in a minute. What always stuck with me was the activity of genes and how critical that was for all the changes that occur because that's what makes the proteins. When we think of protein, we think of protein being the building blocks of muscle. Well proteins actually are functional. There's functional proteins in the body like hemoglobin, which carries oxygen to the blood. It's a functional protein. Insulin is a protein, it's a functional protein. It's not a building block for muscle, it's literally a molecule that has a function in the body. That's a protein. We need proteins and those proteins are regulated by the genes. It started occurring to me that the way to really get results, whether it's fat loss, muscle growth or strength, it's to keep activating those genes because they're driving all the messaging. I started looking into more frequent training and started realizing, going from ... Most people will get once a week training. Like Shortcut to Size, I even train once a week. You hit chest one day and then you don't hit it again till the next week. That's a recovery-based training where you go in there, you annihilate a muscle and then you give it seven days. Well here we're not going in and annihilating muscle, all we're doing is going in and instigating gene activity, but every day we're turning it on. Instead of going in once a week and turning on those genes and then you get gene activity that rises, then it falls, then you wait seven days, then it rises, you're hitting it again while gene activity is already up before it's dropped back down. What I'm trying to create is like a staircase, a fact where instead of letting it drop, if we hit it again, can that activity be enhanced even further than the initial response because you're hitting it again before it's down. We don't really know that, but based on some of the results I'm seeing ... Theory is great. Being a real bench lab scientist, I understand theory is good, but theory doesn't mean much. You can debate whether you do cardio before or after, or cardio on a separate day. Shortcut to Shred what do I show you? Do cardio right in the middle of your workout. Jim:	Right there, right in the middle. Before or after, no, how about during? Think people, all this theory doesn't mean anything if it doesn't produce results. How can you tell me that, "you shouldn't be doing cardio around weight workouts," when I can show you how many thousands of people who have lost weight, broken their PRs and gained muscle while they were doing cardio during their workout. That's nice, you have a theory about when you should do cardio, Mr. Expert, but here's thousands and thousands of people seeing real results. If you think doing cardio during the workout is stupid, how can you explain the results? The results are really all that matters and so what I started finding was that doing more frequent training, daily training, is really the key to keeping the activity of metabolic genes up so that you burn body fat. For example, I just did a photo shoot where I'm about 4% body fat. I had four surgeries done through February and March on my knee, one knee. I haven't done any cardio since January. All I do is full body training with zero cardio and I'm 4% body fat because I'm keeping my genes activated all day. I'm burning fat and carbs like a machine. Nick:	That was one question I had, is yeah, you can talk about thousands of people having the results, but we're talking about you, too, an advanced lifter because one of the great knocks that you hear against full body training is, "That's phase one stuff." Jim:	It really is. What's really interesting is that we typically recommend it for beginners. The reason we do that is because the beginner's adaptation to weight training, the first few months is mainly neurological. It's all learning how to fire nerves, that's how they get stronger. You really don't start building muscle until a month or two ... It's really about neurological changes, so frequency matters. You wanna do the bench press three times a week, not once a week. Jim:	Get the best results and make it realistic. I'm not a food Nazi. I love to eat. I love to drink. I like to enjoy myself. What's the point of being healthy and active if you can't enjoy food, you can't enjoy yourself and have a good time? Nick:	Your latest workouts reflect that, too. They're almost like you recommend categories. It's not like, "No, you have to do this movement." It says, "Pick from the list. Do what you can." Jim:	Yeah, exactly. There's no excuses. That's the thing, everybody ... What I try to show people is, it's really not that hard. You know what I mean? It's really not that hard to be more active and eat smarter. It really isn't. What I try to do is take the science, but then don't complicate it and talk about PPAR and activity, this gene and talking over everybody's heads in the science but, how do we then take that information and make it make sense to a 16-year-old kid, who can then go and say, "Oh, that means ..." Or someone who dropped out of high school and is 35 and doesn't have the highest IQ. Can they understand how to follow my program and can they learn from it? I don't want to just give them a fish, I want to teach them how to fish. That's the whole point. Well, here yeah, you can follow this as I tell you to and get awesome results, but if you listen to why I have you doing this, you can then take that and create your own workout when you go to the gym and there isn't a leg press. You'll be able to go, "Hey, I'll just do this." That's sort of the message I try to teach people. You don't have to food prep. You could go to any restaurant you want and order ... Trust me, you can go to McDonald's and find something to eat. That will be on any diet, whether it's paleo, your intermittent fasting ... Any diet you can go to almost any restaurant this day and age and make a food choice that will allow you to stay within that range. It's just making smart choices. My goal is to just simplify it for people, make it easier. Really, that's what the JYM line is. I was telling people, "Buy creatine, put this much in. Buy beta-alanine, put this much in. Buy branched-chains, put this much in-"
Nick:	I remember, we had one. "Jim Stoppani Tells You How To Make Your Own Pre-Workout." That was a huge article. Jim:	Here, now you can have it all. You don't have to buy them all. It's simplified and makes it easier. That's really the goal because it's my goal. Nothing makes me happier than going into a Starbucks and seeing them sell salami and cheese in a prepackaged ... Like, "They're finally getting ... People are finally getting the protein." Jim:	Or the eggs, "I can go and buy hard-boiled egg. Oh my God, at a 7 Eleven? What do you mean? I don't have to stick to the Slim Jim? I can actually get an egg or a yogurt or a string cheese?" I love that. That convenience factor, that ... It used to be convenience for the average Joe. Now we're getting more convenience for people who want to live better and live healthy. Jim:	That's the thing. There's research that shows it enhances fat loss. I'm living proof. Like I said, I had to stop doing cardio and I'm leaner than I've ever been. I'm in the best shape, except for my right leg, the fact that I can't do certain things yet, but I'm literally in my best physical shape now during recovery just because I stuck with the whole body training. Nick:	That was gonna be one of my questions was, what cardio works best if somebody thinks ... They can't get out of that cardio mindset. Jim:	You can still use my cardio acceleration. You can do that in between sets. You can do tabatas after or in between exercises. Again, think outside the box, add it when you want. It's really not that hard. Nick:	Looking at some of the workouts you've been putting up recently, they look like they would have serious cardiovascular demands inside the workouts. Heather:	Yeah, so he's staying in aerobic the entire time. Jim:	It's an intense workout. Jim:	Yeah, you're going for four minutes straight. Heather:	I haven't tried it yet but that looks brutal. Jim:	... but it's not like what you think of. It's like cardio acceleration, where you're like, do swings, do step ups, run in place. It doesn't have to be cardio to have cardio benefits, what we typically think of cardio. The best cardiovascular benefits are from high, intense interval training, not from long distance running. Jim:	Exactly, that's what it is. What do you do? High intensity exercise, followed by rest. High intensity exercise, followed by rest. That's high intensity interval training. Jim:	That's what weight training is. Heather:	I feel like I'm getting a cardio workout right now. Jim:	Weight training is essentially ... I love that meme, they have the old school boxer guy and he goes, "What do you mean cardio?" It's like, "Cardio, you mean lift weights faster?" Seriously? I know it's a funny meme, but that's really true. Yeah, you can use weights as your cardio. Kettlebell swings are a perfect example. Nick:	I'm glad that we always bring it back to the kettlebell if we can. Heather:	Yes, Nick and his kettlebells. Can we delve into intermittent fasting? We had a really … we touched on it. Jim, I'll let you go ahead and tell us what you're doing and how you got into it. Jim:	Yeah, but I've only started doing it myself because my main concern was muscle mass with the fasting. Jim:	For example, I don't think I know one professional bodybuilder who uses intermittent fasting. When you consider these guys have to maintain, regardless of what they're using to maintain that muscle mass. To maintain that muscle mass, their eating pattern ... There's no way they could maintain it. Nick:	Right, it's force feeding more than it's intermittent fasting. Jim:	When you look at it from that standpoint, anybody who's interested in muscle is like, "I don't want to go ... I'm gonna wake up in the middle of the night and eat." Nick:	Shake by the bed, that's the classic. Jim:	I recommend casein protein before bed so that you have a trickling effect of amino acids so you're essentially not fasting. We've been talking about how to stay in a fed state almost, for anabolic reasons. That's really why I avoided doing it personally. I knew the benefits for fat loss. What the benefits are in the lab is what we've shown, is that most people think when you starve, your metabolism slows down. It does, but that's with long term, where you're not refeeding or you're dropping carbs long term. Calories or carbs for a long period. If you're starving yourself for long, yes, your metabolism is gonna stall. If you are fasting and feeding, what happens is, during the fasting period, your body produces more of these uncoupling proteins. What uncoupling proteins are is, they basically poke holes in the mitochondria. The mitochondria are our energy factories in muscle cells. It's where fat and carbs get turned into ATP. That's what makes energy. These uncoupling proteins literally poke holes, and the mitochondria changes concentration gradient, so you produce less energy, more heat. It's like a car engine. It produces heat and work. The more work it puts out and the less heat, the more efficient it is. Nick:	Starting at like ... What are we talking about? Like eight hours? Jim:	Yeah, but what we do find acutely is that the meal that you follow the fast with is important. When the fast was followed with a high protein meal, the production of those uncoupling proteins had another bump after the fasting. When it was a high carb meal, the uncoupling proteins were blunted, but they were still maintain higher than someone who's not intermittent fasting. Nick:	That's why you eat all these bears? Jim:	The way I do it is, I typically eat at 4 o’clock… and then I train in my feeding window. That way I have more energy. I can recover better so better performance, better recovery during your feeding window. At four o'clock, my first meal is Pro JYM. I have a protein shake. That's it. And then I train. So I train with just protein and Pre JYM. I don't have carbs till after the workout's over, which is a good hour or so. On the days where in might train, let's say I train at 10:00 P.M. and I break my fast at 4, I'll still have just a protein shake or it'll be eggs and salad or fat. They'll be no carbs. Nick:	And it's no calories the rest of the time or is it just drastically-reduced calories? Jim:	Prior to four o'clock, no calories. Jim:	No, none whatsoever. You can drink fluid, water. I typically go with black coffee or unsweetened tea. Once in a while I might have a Coke Zero or Diet Dew, but I don't like to do the artificial sweetener because one of my concerns is that fasting is really a state of the brain, not just in body. You're literally tricking your body that you're fasting. Well, there's ways to trick your body that you're fed. Leucine, for example. The molecule leucine, the receptor that attaches to it ... you ever heard of mTOR? Jim:	They're truly not fasting because they're telling their brain, "You're in a fed state." Now, they're fasting in the fact that they're not really consuming many calories so they're still getting benefits, but they'll get better benefits if you avoid the leucine. One of my theories with the artificial sweeteners is ... There's some data that shows, when the tongue tastes that sweetener, those receptors tell the brain, "Hey, sugar." It tricks the brain. That's what artificial sweeteners do. In some cases, it's been shown to enhance insulin release, more so in animals than ... but, I'm still concerned that that sweet taste is telling the brain, "Hey, we're getting sugar," even though you're not. The last thing you want to do is trick your brain into thinking it's in a fed state accidentally by sipping a sweet, diet ... Even though it's no calories, that sweetness might signal the brain, "Hey, we've got plenty of sugar, meaning we don't have to use ketone bodies any longer. We can switch over, start increasing glycolysis. Let's change up the fuel sources that we're using." Jim:	Yeah, and what's interesting is that at the beginning you go like, "Oh, I can't think. I'm so lethargic." Then about two weeks after you're like, "Oh my God." Sometimes four o'clock rolls around, I have to force myself to eat. Jim:	Well, not even that I forget. I don't want to eat because when I eat, I feel lethargic. There's a lot of times that four o'clock rolls around where I have to force myself to literally eat. That's why sometimes I like just the protein shakes, because it gives me something I feel, but it's not like ... It's weird how you get used to it, because I travel and I speak a lot. It might be like I'll have to give an 8:00 A.M. opening talk somewhere. I used to think, "Oh, I'll have breakfast just so I'll have carbs and I'm sharper when I'm on stage ..."
Jim:	... And then I'm like, "I feel like crap. Why did I do that?" You know what I mean? Once you're used to it, if you actually feel better ... It's kind of funny, I was ... I can't remember who it was, but somebody was telling me, they were like ... I had my guy, it was post workout. They weren't even ... It was like a cameraman or something, "Can I just have some gummy bears? My blood sugar, I'm getting really shaky." And I'm like ... Alcoholics get shaky, too, when they don't have alcohol. You know how they fix the shakiness? They drink more alcohol. The problem isn't that you need carbs, the problem is, you're eating too many carbs and that you cannot go long enough without them. Your body should be able to go a long time without feeling shaky. If it can't do that, it's due to your diet. Cut down on the carbs. You're so reliant on carbs that you cannot even go two hours. Are you kidding me? Without a meal? That's not normal. Nick:	We're just ritualizing our behaviors, too. Jim:	Exactly. He was just like, "Oh my god, it's been two hours. I need some gummy bears. I feel like crap." No, that's the last thing you need. Heather:	We were talking about that earlier where intermittent fasting of all the things I've ever tried, and I'm sure you've experienced this with your clients. It's one thing that can actually eliminate that dependency, that addiction. Whatever you want to call it. Jim:	Research show actually it enhances insulin sensitivity. The research on intermittent fasting is ... The health … I'm talking about the health benefits. Insulin sensitivity, better immune function. It fights jet lag. Did you know it fights jet lag? Heather:	I wish I'd known that two years ago. Jim:	Mountain Time. If you traveled, let's say ... Well, let's say you're in LA, it's Pacific Time and you traveled to New York, which is Eastern Time. Now, when the clock is claiming it's six o'clock and it's starting to get dark, your body is saying, "Hang on, why's it getting dark now? We've got three more hours." Then the next day it does and eventually your body finally goes, "Oh okay. I'm three hours faster," and catches up. Takes about a week or so, right? Another cue we use is feeding cues because we're animals of habit. If you typically eat breakfast, lunch and dinner in reasonably … same time, those are cues that you use throughout your day. When you fast, you erase that food cue. It's almost like erasing the light cue if you could, if you could do that which you really can’t. It erases the food cue if you fast for at least 16 hours. Then, if you have your first meal at the normal time, like LA, 4:00 P.M. When I'm in New York, I fast for at least 16 hours and I don't eat till 4:00 P.M. New York time. I eat that Pro JYM shake, my body goes, "Four o'clock. It's four o'clock." It's an extra little cue that fast forwards your body's adjustment to the new time zone. Nick:	It sounds like you are a seven days a week faster. Do you think that that is the best approach for somebody to follow? Because there are 5-2, there's every other day. Jim:	Yeah, I really don't eat that ... Probably only like 3,000 calories. Heather:	That's what I did. Jim:	You want to do those consecutive days. You want to do two full days, and ... There's a couple. You can do where you only do 600 calories. I prefer a full ... To get the true health benefits like the immune boost and the help with the jet lag and the insulin sensitivity, you want to do a full fast. You need to fast, you know what I mean? Fast. It's two days, 24 hours and then the other five days you're pretty much loose to what you can eat. You have no time restrictions. Obviously you don't want to be eating pizzas all day, but you can be a little looser on those days because of those two days that you gave it your all where you literally ate nothing. Your reward is, "Now on these other five days of the week, I can eat any time I want, and within reason, pretty much what I want." Jim:	I've done that, too. I don't like that so much because I like the regular 16-8 fasting. I just think it's better to have that repetition versus two days and then full eating whatever you want. Nick:	One of the first guests that I had on the podcast was this great researcher named Dom D'Agostino who's done a bunch of work about fasting. I remember asking him, "Because you fast, do you think that makes you drink more coffee?" He kind of thought about it and he said ... He drinks a ton of coffee. He laid it out very calmly, but it sounded like this guy drinks like six pots of coffee a day. Heather:	What's wrong with that? Nick:	You're a caffeine guy. Jim:	I'm a caffeine guy. I own it. I wouldn't say it increased. Jim:	Like I said, the reason I never wanted to do intermittent fasting was because I was worried about the muscle mass loss. Now what's interesting is, there's new research showing that if you take a lean individual, and this is just using BIA ... Sorry, BMI. Jim:	That's how we measure water. Sorry but, we're doing a study on, when I manipulate my water levels ... Sorry. It's a testing method but, BMI, Body Mass Index. They looked at lean, overweight, and obese and fed them a high protein meal. The lean guys, protein synthesis was through the roof compared to both the overweight and the obese, meaning the leaner you are, the more anabolic you might be. So, the old strategy of bulking up and getting fat might actually be working against your muscle mass gains. Staying lean might keep you more anabolic. To test that theory what I've been doing is literally using intermittent fasting to get my body fat down to as low as I can, and then see how my muscle mass responds. So far, I've actually been gaining, small amounts because I'm 49 and natural and pretty much at the peak. It's to like I'm gonna gain an inch on my arms, but if I gain a quarter inch or an eighth of an inch, that's a big deal for me, especially at this ... That's pure muscle. Jim:	I am literally gaining, now that my ... I'm sort of done trying to drop body fat to some degree. Now what I'm doing is just maintaining it around 4%. What it does is, it allows me to play with my protein and the amount of calories while still staying lean. I'm finding I have no trouble whatsoever with muscle mass. But muscle mass is not my goal. It's really not my true goal anymore at this age. I'm always trying to obviously get my arms big. Now it's more about building more ... It's more bodybuilding. Adding more middle delt, adding more ... Those sorts of changing. Jim:	Yeah, which is still gaining muscle, but it's not like gaining huge amounts of muscle. Jim:	Yeah. What I do find is that, with the intermittent fasting, with the daily training, you're getting the best of both worlds. Fat loss, muscle gain, health. Heather:	You've got it in fifth gear and you can just kind of cruise along. Nick:	If somebody's curious about intermittent fasting, what should that keep in mind when they're starting this in terms of how to time their workouts? Should they try to get lean first or should they do this to get lean? Heather:	You're 4% Jim. I don't know if you can go much further. Jim:	... but for most people, you probably could be leaner. You know what I mean? Most people's goal ... Most people probably aren't 6% body fat. Most people can always be a little leaner. Now my recommendation is more, "What's the point of having muscle if you cannot really see it?" Unless you're an athlete. If you're a powerlifter, a strongman, an athlete that's fine, but if you really want ... If you're just lifting to look better, why would you want to cover muscle with body fat? Nick:	Right, and having gone to a couple of powerlifting meets here to watch my friend or watch them streaming online, a lot more powerlifters are showing up looking crazy ripped these days to. That guy used to be a little bit more of a rarity, but now they're a lot more of those sort of guys. Like Chinese Olympic weightlifters, they're crazy lean a lot of them. Heather:	I feel like the dirty bulk has gone out of vogue a little bit. People are not ... They're actually trying to bulk, kind of what you're talking about without gaining a whole lot of extra body fat because really, what's the point? You're gonna stress all your systems trying to do that. Jim:	Exactly, and it's never good to be yo-yo dieting. What happens, you store a lot of toxins in your fat, and so every time you diet and lose body fat, you release those toxins into your blood stream. Heather:	And that's why you feel like crap when you diet. Jim:	Yeah, no seriously. When you're losing fat, you're releasing those toxins like styrene from styrofoam, which gets stored in fat cells. There's a lot of toxins that get stored in the fat cells. If you just stay lean ... You just get lean and stay lean. Jim:	Always gaining, losing … The worst thing you can do is the yo-yo diet, even if it's bodybuilding style. It's not healthy. I'm working out with a lot of athletes who have to lose weight. I'm convincing them to live at their fighting weight. Then you know what happens, then you actually get stronger because once your body adapts to that weight, it's no longer a stress to maintain it. The only reason you get weaker when you lose weight is because it's a massive stress on the body to lose all that body weight. Once the body has adapted to the body weight and it's easy to maintain, that's your normal homeostasis now. You're working against yourself by living at 220, and then dropping down to 198 for your fight. Jim:	Yeah, and then you wonder why you're so weak during the fight, whereas if you lived at 198, your body would be adapted and you'd walk in there at your strongest form. Nick:	Do you find the people who are approaching intermittent fasting from a fat loss perspective because they want to change their body composition, maybe they are overweight. Do you find that's a less stressful approach for them ultimately in terms of the stress on their body? Jim:	Yeah, because like you said, it's so easy to do. It's yes or no. It's far easier to follow because the rules are a lot simpler. It's not like, "Well, I can have my carbs now," or, "Wait, is it time to ... Wait I'm not supposed to ..."
Jim:	Yeah, this is like, yes or no. "Can I eat? No." Jim:	It does, because, like I said, when you're waiting in a Starbucks line, you don't do that sort of mental math with your diet. Jim:	Yeah, "If I just had one cake pop, let's see. That's how many calories? How many carbs? If I don't have rice with my dinner, and then ..." You don't have to do any of that. It's just like, "No." Nick:	Right. Before we started recording you put it really well. It's what you eat versus when you eat. What sort of person are you? Jim:	Yeah, with intermittent fasting, you can't eat when you want. You can't, but you can pretty much eat what you want. Or, you can eat when you want, but you cannot eat what you want. Those are the two main diet strategies. Jim:	The first meal does matter. For someone who's more ... If you really ... As long as you do the 16 and eight, as long as you stick to those rules ... Again, I wouldn't worry for the average person. However, if you really truly want to maximize your results, then I would suggest sticking with a high protein, low carb meal as your first meal and then maybe an hour or so after, start including carbs. Jim:	It's best to train in a fed state. It's always best to train in a ... Especially if you're interested in muscle mass and performance. If you're just an average person who just wants to maximize fat loss, it doesn't matter when you train. If you want to maximize your performance and the results you get, train when you're fed. Jim:	Yeah, well, do you really want to talk about fasted cardio? What the research shows on fasted cardio is pretty debatable because what we used to think is that you burn more fat during the exercise fasted. It's true, you do, but what happens the rest of the day? That's what nobody looked at. We were all telling people, "Fasted cardio is the best way because you burn more fat." That makes sense, however, it doesn't lead to better fat loss in the long run. So why is that? Well, we started looking at what's going on the rest of the day. The more fat you burn during your workout, the less fat you burn the rest of the day. The less fat you burn during your workout, the more fat you burn the rest of the day. Do you work out more, or do you have the rest of the day more? How much time is your workout and how much time is the rest of the day? So you want to be maximizing fat burning during the rest of the day, not during the workout. What does that? High intensity interval training. What does high intensity interval training burn? Carbs, all carbs during the workout, but, the rest of the day you're burning fat like a mad man. That's how it works. Fasted cardio, what we used to think is a snapshot. We had a snapshot of what's going on acutely and then we make projections. "Oh, well that means you're gonna lose more fat because you burnt more during the workout." Yes, if you also burnt more the rest of the day, but guess what, you don't burn more the rest of the day because you burned more during the workout. Jim:	I don't recommend fasted cardio for the average ... If you're like me at 4% and you're like, "You know what, I just have this one spot that I'm trying to get," fasted cardio might work for you then, because that's when you're really trying to get rid of every little bit of fat. If you're at 12% body fat, it's not gonna make a difference if you do your cardio fasted or if you did your cardio after McDonald's. Literally it doesn't. Nick:	We're talking about somebody who's fasted versus somebody who's doing intermittent fasting as well. It seems like once you are actually too ... You've adapted to that intermittent fasting protocol, maybe do you have a little bit more laxity there like, "I could certainly train fasted if I wanted to and-"
Jim:	I work out. I stay active all day, all day. That's one of my other messages, is, "What is a workout?" We've become so sedentary that things that we normally do all day, walking, lifting, moving, picking things up, we have to condense into an hour because we sit on our butts all day. That's not how ... We don't exercise. We're not made to sit around and then go, "I'm gonna run like hell for an hour then I'm gonna sit down the rest of the day." Even the research on television watching shows that even if you lift an hour or you work out an hour a day, if you sit for ... Don't quote me on the actual hours, more than three hours a week in front of the television, the benefits of the workout are pretty much gone. Jim:	You cannot be sitting all day. We're not made to be sedentary. I'm active all day, even when I'm fasted. I might go for a hike in the middle of the day fasted. I'm not gonna go to the gym and train a full ... I might if that's the only time I can. If I know this is my only block of, I'll train fasted if I have to. It's not ideal, but again, it's not ... When you're fasted and you're used to intermittent fasting and you exercise, it's not like, "Oh my god, it's so ..." It's normal. Nick:	I remember Dom D'Agostino, he set the record for the most weight lifted in an hour and he was seven days fasted at the time when he did it. All he did was squats for an hour straight. There's a video of it online. It's terrifying, but he's a freak, too. Jim:	And I do videos. I'll do videos on my social media, parking the last spot. Taking the stairs, don't use the escalator or elevator. Jim:	Without a doubt, because that's the type of activity that's most important. Staying active all day. It's just finding the ways to stay active. In addition to your … Sure, you’re still gonna do your workout, but in addition to the workout, you still need to stay active. Nick:	That is one knock that people have against full body training, is they say, "If I have to go full body workout, I'm gonna be so crushed I can't do anything else. I'm only gonna do triceps and chest today because that was I can still play with my kids later." Something like that. Jim:	The other thing that I preach about it was I call my 30/60 rule. It goes on with that data from television watching. What it shows is, if you sit for more than 30 minutes, I'm getting back to gene regulation. Genes that are involved in burning fat turn off. Genes that enhance fat storage get turned on. Genes that help prevent metabolic disorders get altered if you're sitting for too long. Nick:	That's a great rule. Heather:	That's a great rule. Nick:	There's something really important in what you're saying there, too, because people talk about genetics casually as if it's a death sentence, always like, "Blame it on genetics. I'm cursed," or, "You're blessed because of genetics," but you're saying you actually have a lot of control over yourself and your genetics. Jim:	Epigenetics are critical. What epigenetics basically are is things that we do. The food choices that we make. Environmental factors all affect our genes that we then pass on. It's not just genes that have been passed along. Those genes get changed along the way based on our environment, things we eat, things that we get exposed to. That changes the genes that we then pass on to our children. Staying active, eating a good diet can actually enhance the health of your offspring. Nick Collias:	It's a good message to end on. Well, thanks so much Jim Stoppani for coming to talk to us.